He's back, and it's not even necessary to add anything to his name. "Jason Bourne" is enough. After nine years off, and Tony Gilroy's able but rather dispiriting 2014 spin-off, Damon has donned the mantle again. He's as good, with the same mix of intelligence and explosive physicality at 46 as he was at 32 when he was first fished out of the water not knowing who he was. And he, or that is his character, still doesn't, but this time he gets closest yet to knowing. In many ways the game is the same: for successful sequels that's how it has to be. There are important new twists, references to whistleblowers, malware, and Snowden, a Silicon Valley rich kid rueing a "back door' deal with the government. In fact, this is the Bourne film with the widest implications about global politics. Plus here, generations are turning over. The old guard, bristling with stylish meanness, appears in the person of Tommy Lee Jones, his face wrinkled like the gnarly trunk of an ancient tree. As Dewey, head of CIA, he's taken on the duplicitous role of Brian Cox, whose style reminds us of Samuel Johnson's saying, "Patriotism is the last refuge of the scoundrel." Like Brian Cox's CIA section chief Ward Abbott, Dewey too wants Bourne dead, and pronto, and has devious schemes afoot. Counter to Dewey there's a woman proclaiming herself the new generation, who, like Joan Allen before her, wants to "bring Bourne in" instead of just offing him. She is a rising CIA executive (close to Dewey, at first), with the innocuous name of Heather Lee, and she's played by the beautiful, if enunciation-impaired Alicia Vikander, who talks as if she had three wads of chewing gum in her mouth. Her expressionless face doesn't give away what she's thinking. She's more mumbly techie than siren. When things start out we're back to basics again. Jason Bourne is living as a bare-knuckle fighter in Serbia like Matthias Schoenaerts in Jacques Audiard's Rust and Bone, living off the grid and staying in shape for the mayhem to come. His violent exile ends abruptly when he's approached by Nicky Parsons (Julia Stiles), his former Paris CIA liaison in all three of the earlier Bourne films. She's got a thumb drive containing a whopper of a document theft - the info about a whole string of CIA black ops, including the one Bourne was tailored for, Treadstone. It shows the Agency has got a new one under way, Iron Hand. So Nikky's become a whistleblower now, working with Christian Dassault (Vinzenz Kiefer of Baader Meinhof Complex) in Iceland. She and Jason meet in Greece, in Syntagma Square, during a huge demonstration. Of course! This is just the kind of massively complicated crowd scene for which the series is known, with lots of cross-cutting between Bourne, Langley, and a mean CIA "asset" played relentlessly by Vincent Cassel assigned to kill Bourne. Had "Asset" and Bourne sat down for a cup of coffee at any point in this movie, things might have gone differently. Instead Nikky and Jason get involved in a chase. Things go badly, Nikky passing on a key to Jason like a fallen runner in a relay race. Bourne is off to Berlin to meet with Christian Dassault and has a few minutes to find out stuff about his dad. It's about time that the search for his identity finally leads him back to his father - and hints that his origins had unexpectedly idealistic elements in them. That's what this episode offers: the most detail about the origin story yet and hints that there was goodness in the origins of David Webb (aka Jason Bourne), after all. I don't know why Bourne puts the thumb drive into a computer that's online so his location immediately pops up on the grid and Dewey can call out German operatives after him. He might just as well put his thumb in an electric socket. But, if clumsily made, the point is this is a new post-Snowden world where there's nowhere to hide. Heather had planted malware in the black ops file, anyway, and so she can sneak into it in the Berlin computer from Langley and delete it. Her ability to hack into a global power grid is a factoid you may understand better if you've seen Alex Gibney's explosive new documentary, Zero Days. Or watched "Mr. Robot" episodes. Jason Bourne is in the same world. Anyway, on to London Paddington (another crowded venue) to meet up with a CIA retiree called Malcolm Smith (Bill Camp), allegedly a founder of Treadstone, to find out how his father started him off in the game. But poor Smith gets pushed around like a piece of baggage as Heather Lee, who's in London herself, and Dewey, who may be on remote, battle for Bourne's life. Much excitement after Bourne triggers a general evacuation of surrounding big buildings to make finding him harder. These sequences, which include another shootout with Cassel's assassin "Asset," are a marvel of complicated staging, though somehow they feel muddled in impact because the Malcolm Smith character isn't made very interesting. But, onward again! Heather arranges for Bourne to go to EXOCON, a big cyber convention in Las Vegas. She fixes his papers electronically so his fake identity passes customs. The presumption is things are so wired now, such things might be possible. The third big episode, and the major new subplot, hinges overtly on the issue of "safety" vs. "freedom." It features bright young Silicon Valley billionaire Aaron Kalloor (Riz Ahmed), whose social media site Deep Dream has billions of members to whom he feels a responsibility to protect their privacy, which he now realizes he has betrayed. (Whether this is true of Facebook has often been questioned. But after Snowden's revelations, does anybody believe in "privacy" anymore?) Kallor made a shady deal with the CIA's Dewey to provide the government with a "back door" into Deep Dream in return for massive amounts of startup money. Only now that he realizes the extent of the invasion of his members' privacy involved, he wants out. Perhaps the name "Aaron" is a homage to the Internet freedom martyr Aaron Swartz; involvement of Riz Ahmed reflects a new trend to cast actors of Arab descent (as with Egyptian-American Rami Malek of the very popular "Mr. Robot"). There's another sniper scene, a deadly showdown with Dewey, an ironic raprochement between Bourne and Heather Lee. Can we complain that there is a long Demolition Derby between Bourne in a fast black car and the Asset in a muscular SWAT team vehicle? If feels as if we, the faithful Bourne fans, know more about Bourne's past now than he does, since for many of the sequences in Jason Bourne we can remember a similar, sometimes better one. We've done the Demolition Derby - outside Moscow, a more dogged, less expensive-looking one. I find myself longing for that shootout with the sniper in the snow outside a French country house, and I always miss Franka Potente, Bourne's unexpected sidekick lost early in the second film. I miss the superb hand-to-hand combat with a steely German fellow Treadstone operative. Such things can never be done quite so well the second time. But still Jason Bourne was a pleasure: as William Burroughs used to say, once the needle goes in, it never comes out. 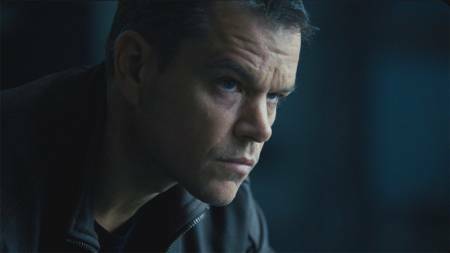 Jason Bourne, 123 mins., premiered London, Paris, and Vegas 11, 12, and 18 July 2016. It opened in the UK 27 July and the US 29 July 2016.